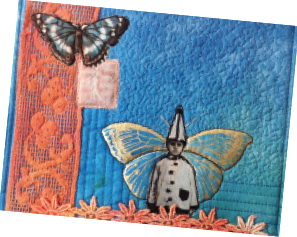 May 2019 program details for the Connecticut Piecemakers Quilt Guild. Lyric Montgomery Kinard is an award winning artist with a passion for sparking the creativity that she knows each of her students possess. With playful support and gentle encouragement she will take you through your first steps on a new path, seeing the world through the eyes of an artist. As an artist, author, and educator she transforms cloth into art in her studio and timid spirits into confident creatives in the classroom. Lyric was recognized for her talents as the 2011 International Association of Professional Quilters Teacher of the Year and is the author of the book Art + Quilt: design principles and creativity exercises. She has written extensively for Quilting Arts Magazine, appeared on Quilting Arts TV, and The Quilt Show. In her past life she was a musician, earned a BA in English Literature from the University of Utah and has also formally studied architecture. My goal as an artist is to remind humanity of the strength it possesses. In a world where too often, the images we feed ourselves are full of violence and fear, I strive to uplift. In a many layered process I gather intriguing materials both old and new. I marvel as plain cloth is transformed as it absorbs dye and paint. The meditative process of mark making with thread allows me to truly see and understand my materials and physically connect with my subject. Slowly order emerges from disarray, beauty from chaos. The tactile nature of cloth, its texture, richness and malleability are what have drawn me to this medium. Fabric has a history almost as old as humankind; from birth to death we wrap ourselves in cloth. It brings us comfort and protection. It defines our individual identities. Quilts hold a particular fascination for me. During a time when creative women were restricted from becoming artists, quilts became an acceptable means of expression; works of art imbedded in an object of utility. The cloth I layer and stitch is freed from utility. My cloth becomes a statement about the role of women, about the world around us and our vital place in it. For more information about Lyric and to see examples of her work, visit her website at lyrickinard.com. photos + foil = fun! Come spend a delightful afternoon playing with both foil and photo transfer. Leave with some little winged friends, ready to quilt into lovely postcards or art quilts. All you need is a pair of scissors, yourself, and a sense of adventure! Come with your scissors and a sense of humor and adventure! Lyric will provide the rest. ; Please be advised that Citra-Solv used in class has a very strong orange odor. Kick-start your creativity and learn about the basic elements of good design through a series of short, hands-on exercises. Learn why some colors fizz while others explode, why some quilts calm and some excite. A few simple tools from the artists kit will help you take your work, whether traditional or contemporary, to the next level. Students will discuss some of the basic principles of design including focal point, line, texture, color, shape and motion. Quick, hands-on exercises will help the student to understand and implement these principles in their own artwork. We view and discuss great artworks and have very positive and helpful critique sessions.